Oranges & Sunshine is a fine film. 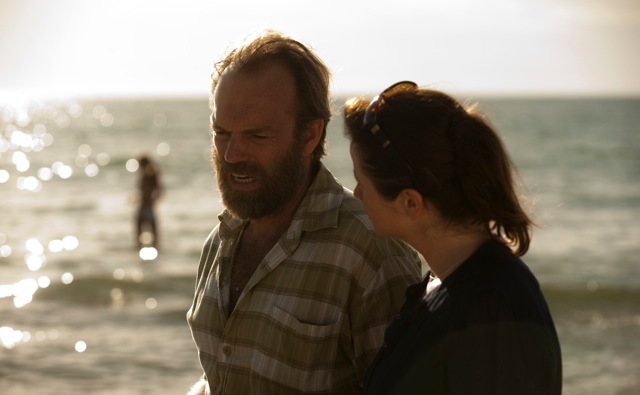 A UK/Australia co-production directed by Jim Loach and starring Emily Watson, David Wenham and Hugo Weaving. Telling the true story of Nottingham social worker Margaret Humphreys who, in the late 80’s uncovered a scandalous event in the history of relations between Britain & Australia – the forced migration of thousands of children from the UK. Deported children were promised oranges and sunshine but they got hard labour and life in institutions, some suffering physical & sexual abuse in the hands of their “carers”. Director Jim Loach working from a fine screenplay by Rona Munro elicits superb performances from his stellar cast – his minute attention to detail in the performances from the secondary supporting cast – mostly portraying the abused children, now adults, some severely damaged from the experiences they endured, is one of the great pleasures of the film. Emily Watson as Margaret is a commanding presence, but it is David Wenham as a curious case – Len, a self made man, victim of horrible abuse by the Christian Brothers of Bindoon, who really stood out for me. I am usually very aware of his nuanced-ticky performances but in this film he is understated and heartbreaking. The film is very simple in its telling, no over the top dramatics, no showy cinematography or period production design ( set a good quarter of a century ago), perhaps it does lack some cinematic oomph and could have been well served as a TV movie, but that is a minor quibble as the scandalous story needs to be told and hopefully will find itself an audience to appreciate its worth. It is a very sad film and most will be touched by the travesty that occurred in the not so distant past. Oranges & Sunshine opens in Australia next Thursday – June 9. I am very much looking forward to the cinema release of the new English/Australian co-production “Oranges And Sunshine”. Based on the book Empty Cradles by social worker Margaret Humphreys, who in the 1980s stumbled across the plight of around 150,000 children sent from care homes in England to Australia and other Commonwealth countries, into church run or other institutions, where many suffered years of abuse or even forced labour. Many of the children were told their parents had died. Recently both the British and Australian governments finally apologised for the scandal. Directed by Jim Loach, the film stars Emily Watson in the role of Margaret. Hugo Weaving and David Wenham add support playing some of the abused children as adults. The film looks at the period when the scandal was uncovered. It focuses on the stories to come out of Australia and her relationships with the people she helps to find their families. The title of the film comes from the promise one man says he was given as a child that in Australia life would be full of “oranges and sunshine”. It recently premiered at the Pusan International Film Festival and will be competing in the upcoming Rome Film Festival. It will be released in Australia and England early next year. It will be a powerful and moving film experience and it is a story that needs to be told.